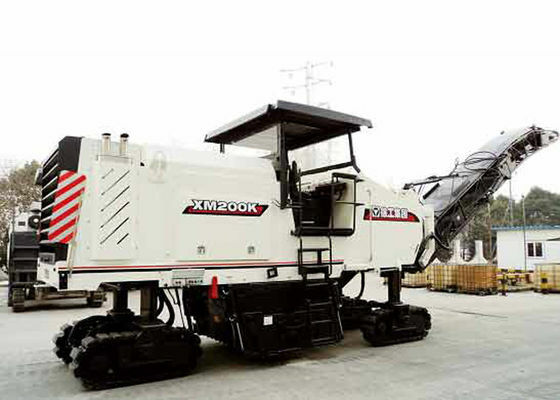 XM Series milling machine is one of the main asphalt concrete road maintenance equipment, mainly used for large-scale highways, urban roads, airports, freight yard, etc for renovation of asphalt pavement. One-time removal of entire concrete overlay. It can also be used for cleaning protuberance, oil layers, retieulation and vehicle tracks as well as road trench, tunnel excavation. cement road surface roughening and dislocation smothness. The equipment features advanced performance, high efficiency, simple process, easy control of milling depth, flexible operation, good maneuverability and the old material recycling and utilization. It is an ideal equipment for pavement maintenance and renovation. ※The material conveying system consists of the material collecting belt and the material discharging belt. The two-step belt conveying devices are stepless speed regulation control, and the material conveying belt can be freely folded by hydraulic pressure. ※The large-power CUMMINS engine with the power of 447KW is matched with full set of electronic engine control device which fully meets the American standard and European standard, has the overall monitoring function which ensures extremely high working reliability and low fuel consumption, and has the fully automatic overload control system to carry out the overload protection to the engine and ensure the miller continuously obtain best power at the same time. ※The milling drum is driven by 12 high-strength V-typed belts to ensure that the power is sufficiently and effectively transmitted to the cutter; the fast cutter and cutter rest replacement system is taken as the standard part assembly, which is easy to be replaced at any moment. 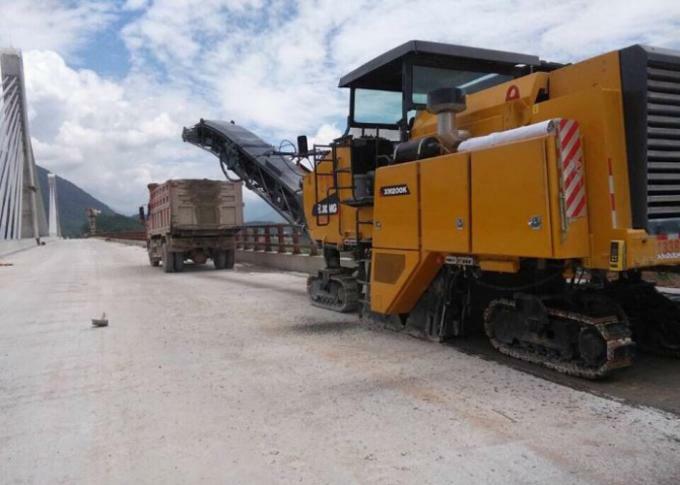 Furthermore, cutters with different performances are provided to mill the material ranging from the soft asphalt to the hardest cement concrete road surface. The cutter arranged in spiral shape ensures the smoothness of the cutting surface. The material discharging vane on the rotor formed by the milling cutting rest ensures the milling material effectively transmitted from the milling drum the initial belt conveyor. ※The moving driving system with 4 highly wear resistance rubber crawler belt ensures obtaining the largest traction performance on the precondition that the working speed of the machine is not reduced. The working and moving speed belongs to the stepless speed regulation, with four-wheel independent steering system which has 4 steering modes to be chosen, including the front wheel, rear wheel, front and rear wheel matching and crab moving type, with high working sensitivity. ※The milling depth control: the milling machine is provided with a set of precise automatic control device which is convenient for controlling the milling depth. Based on the two side plates of the milling drum, the controlling device adjusts the length of the oil cylinder in the front crawler supporting column by continuous signal output and feedback, for keeping the arranged milling depth. The driver can monitor the milling depth on the control tales or ground, and the manual control can exceed the automatically controlled instructions. ※Automatic power adjusting system: the fully automatic power adjusting system makes the engine load automatically implement the best match between the milling power and the driving power. The adjustment of the automatic power can ensure the mechanism to exert the best effect on any working conditions and not make the mechanism overload. The automatic adjuster can exceed the manually operated instructions. ※The intelligent control system can implement the advanced functions such as the online display of the information, malfunction diagnose, malfunction alarm and maintenance curing prompt, etc of the whole machine on the working mode and moving mode; meanwhile, all datum can be objectively read by virtue of the matched monitor. ※The hydraulic system, moving device: conveyor, cooling fan, water injection device and all hydraulic control elements, etc, are driven by the independent hydraulic motor. All hydraulic oil pumps are driven by the diesel engine through the transfer case, the return hydraulic oil and the hydraulic oil of all control –function elements are filtrated by the oil return suction filter. The system technology is advanced with reliable performance.